We open this examination of the history of the Quakers and their core doctrine of the Inner Light that is allegedly within all of mankind with a bit of testimony by Mary Conrow Coelho. Coehlo speaks to us from personal experience as a third generation member of the Religious Society of Friends (the Quakers). She is also a long time mystic herself and author of Awakening Universe, Emerging Personhood: The Power of Contemplation in an Evoloving Universe, which is a book of creation spirituality very much like that taught by another misguided mystic Matthew Fox. The words Brian spoke brought a knowing that connected deeply to my being. . I imagined known and unknown forces within my body that were sustaining and forming my identity — all this, far beneath conscious awareness. It was a kind of illumination. I knew how deeply and fully I belonged to the universe and to the earth. there was the small Quaker meeting three miles from our farm, attended by all three generations of my family. We went every Sunday. To this day, almost fifty years since I left home, I could tell you the names of the regulars, where they usually sat, and whether or not they were among those who were often moved to speak. Miss Rushmore spoke every Sunday from near the front, on the left. I remember fondly, too, picnics on the meeting grounds, and especially community picnics at the Taylor’s farm on the Delaware River. The grade school, run by the meeting, provided a secure home for this vulnerable child. So here we now have firsthand corroboration from someone who has grown up in this particular “faith tradition” concerning the continued Quaker emphasis on the “Inner Light,” which is the essential doctrine leading to George Fox’s founding of the Religious Society of Friends (the Quakers) in the first place. Not only that but as you will come to see Fox and the Quakers believed that this Inner Light, “the seed of God, the indwelling Christ” was inside every man. This is why you do not expect a Richard Foster to place any importance of being born again because in Quaker theology this is not necessary. Conversion would instead be to awaken this “divine spark” already planted within. I pray you are now better able to understand why the new evangelicals who practice this contemplative spirituality like a Rick Warren can hedge around the Cross. 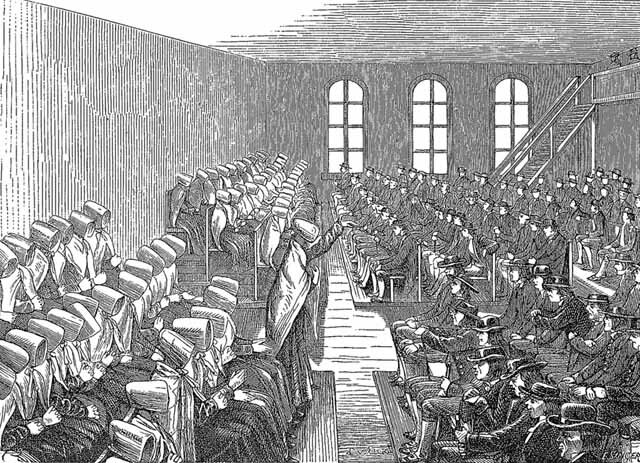 The meeting for worship of the Religious Society of Friends, the Quakers, usually lasts an hour. It may be entirely silent, or individuals will speak as they feel led. There is no prearranged program (although some Quakers do now have a programmed meeting). As I learned in my youth and now fully embrace, the meeting is truly the priesthood of all believers. That is, all participants are assumed to be willing vehicles for a message to the community. Both the speaking and the silence can provide those gathered with an experience of inward divine presence and guidance. Sometimes the first person who speaks says something that touches others, so that later in the meeting, one or more feels led to speak to the same theme, out of their own experience. These verbal sharings do not come back to back. Significant intervals of silence are themselves a full presence, not a mere waiting. As well, those gathered know to avoid slipping into rational argumentation and discussion. Rather, we stay “close to the root.” That is, we keep close to the fount of divine creativity. At Fordham I delved into the western contemplative tradition, particularly as experienced by Teresa of Avila, Bonaventure, and Meister Eckhart. I learned that in our western contemplative path to spiritual growth, there is a preparation, followed by a letting go, and then a letting be, to use Eckhart’s words. In this way, the sacred depth of our identity can be known. I learned, too, of an integration that is possible, an integration of one’s personality. Called the unitive life, this integration makes available, day in and day out, the wisdom at the core of our being. I thereby learned to honor the mystical side of Quakerism and to see it as part of a far older tradition that takes as its foundation the experiential side of the religious life. But it was the new story of the evolutionary universe — specifically, the scientific story as translated by Brian Swimme — that enabled me to integrate the manifest, physical world into a dynamic, sacred whole. This Emergent spiritual mumbo jumbo of convoluted contemplative spirituality couldn’t have been posited any better by Brian McLaren himself. You might also want to note where Coehlo mentions “the unitive life” above because in my article Emergent Church: Brian McLaren And Theosis I point out that the Emergent Guru himself covers this idea in his seminars as well. I will also provide this link to chapter 10 of Mysticism by Evelyn Underhill, who is a source recommended by Guru Foster himself, and oddly enough it is called “The Unitive Life.” So I have opened this work with the above information about, and from, Dr. Mary Conrow Coehlo as her own personal testimony to where this “Inner Light” and her dabbling in metaphysical mysticism would ultimately lead her. If you investigate Coehlo further you will quickly find out that she becomes heavily involved in the same “creation spirituality” espoused by the mightily messed up mystic Matthew Fox. In Emergent Church: Quantum Shift To Panentheism I have previously informed readers this is also the very same direction that Emergent theologian Leonard Sweet has been heading as well. Yes, I am quite aware of the whining argument emerging by the spiritually simple that says this heavily referenced information is simply “guilt by association.” However, one cannot argue with the literal facts that Dr. Mary Conrow Coehlo herself is a third generation Quaker who is in a much better position to know what she has been taught than those of us who have never been Quakers. In my months of personal research from the actual books and articles I have been laboriously quoting to you I can assure you that Dr. Coehlo is also quite typical of where all those who abandon Biblical doctrine in favor of subjective experience in contemplative spirituality eventually end up. Granted, she is further along the broad road of deception than many others, but those who continue to practice this reemerging Gnostic mysticism will also inevitably experience the same delusion which is actually sent by God himself (see–2 Thessalonians 2:10-12). Men and women, as the end of the Age of Grace rapidly approaches, and as we begin to witness The Falling Away Of The Evangelical Church, this so-called “Christian” meditation in contemplative spirituality is not some kind of a game and it is not something that any human being has control over. This kind of “spiritual seeking” is trying to have God fit a “formula” which is not consistent with the Bible. Nowhere in Scripture will you ever see the LORD God Almighty ever put Himself at the beck and call of His creatures. Of course we are to meditate…on the Bible text. Of course we are to seek the Lord…in conscious prayer and in the Bible. No one is arguing with this. However, as we move along you will see that the “Inner Light” that was supposedly in all mankind, which Quaker founder George Fox “discovered,” is not consistent with Biblical revelation. Coehlo and other Emergent spiritualists aside, the soul of unregenerate man is not “sleeping,” it is in literal fact, dead. And the absolute truth from God’s Word is that prior to personal faith in Jesus Christ mankind is spiritually dead and must be “born again” in order to ever hope to commune with God (see–John 3:1-8; 2 Corinthians 5:17). At this point in our discussion of the history of the Quakers and their core doctrine of the Inner Light we turn to an article entitled The Religious Society of Friends (Quakers) as a Religious Community by Anne K. Riggs, who is a Friend herself. Dr. Riggs also just happens to be a member of the “staff of the Ecumenical Secretariat of the National Conference of Catholic Bishops” and co-editor of the Quaker Theological Journal called QUEST: Quaker Ecumenical Seminars in Theology This gives us further, and quite obvious, confirmation of the ecumenical bent that men like Richard Foster still have toward the apostate Church of Rome and with Dr. Riggs we know we are dealing with someone who knows exactly what she is talking about. As most know the Guru of Contemplative Spirituality himself is a Quaker and his Reformation-denying theology is so weak spiritually that as of today (5/5/06) Foster remains listed as a “living spiritual teacher” at the interspiritual website of the Living Spiritual Teachers Project as someone whose teaching is compatable with teachers of New Age theology and Zen Buddhist Roshis. In silence [meditation] which is active, the Inner Light [supposedly God] begins to grow ¬ a tiny spark. For the flame to be kindled and to grow, subtle argument and the clamor of our emotions must be stilled. It is by an attention full of love that we enable the Inner Light to blaze and illuminate our dwelling and to make of our whole being a source from which this Light may shine out. Words must be purified in a redemptive silence if they are to bear the message of peace. The right to speak is a call to the duty of listening. Speech has no meaning unless there are attentive minds and silent hearts. Silence is the welcoming acceptance of the other. The word born of silence must be received in silence. Can you see the Gnostic influence here? Only these “enlightened” Christians who understand and practice the spiritual discipline of Contemplative/Centering Prayer, the silence of this alleged “Christian” meditation, will really learn to hear God speak. Why? Pennington says that “in the end” we have to learn that “God speaks by silence and can be heard in silence.” This brings to light that it is actually this subjective experience (meditation) which determines what God has allegedly “said” and thus we bring this new gnosis (knowledge) back to the Scriptures as we then use it to interpret them. And please note the name Basil Pennington, we will be talking more about this man of whom Tony Jones says “is a leading authority on Centering Prayer” as this work at Apprising Ministries moves along. I cover Teresa of Avila in more depth elsewhere, but here you can clearly see that her mystic musings have undoubtedly impacted Quakers like Richard Foster. In fact in Celebration of Discipline he includes this troubled Roman Catholic nun among “the great writers of the devotional life,” which he says goes “from St. Augustine to St. Francis, from John Calvin to John Wesley, from Teresa of Avila to Juliana of Norwich” (5, emphasis mine). This is another time we can note that the highly ecumenical Foster is undoubtedly influenced in his own aberrant mystic views by the apostate Church of Rome and in opposition to the theology of the Reformers Guru Foster obviously considers the Roman Catholic Church a part of the true Body of Christ. first meaning of mysticism is experience itself. As Kabir, the great creation mystic of India, put it in the fifteenth century, “I say only what I have seen with my own eyes–and you keep quoting the Scriptures!” He goes on, “Experience, O seeker, is the essence of all things.” The mystic is keen on the experience of the Divine and will not settle for theory alone or knowing about the Divine (48, emphasis mine). Men and women, once again you have just read where all of this contemplative spirituality will always lead one who continues in it, and in words which are eerily similar to those now coming from misguided men like Foster, Emergent Church Guru Brian McLaren, Emergent inclusivist Doug Pagitt, the “living spiritual teacher” Alan Jones, ad infinitum among the spiritually deficient leadership of the Emergent Church today. Kick out confidence in those who “keep quoting the Scriptures” in favor of the subjective experience of “knowing about the Divine.” But these Gnostic “geniuses” have forgotten something of vital in their foggy and oxymoronic “cloud of unknowing.” You see apart from the revelation that our loving Creator condescended to provide regarding Himself through Holy Scripture in the first place all spiritually dead mankind would ever be able to “know about the Divine” is that there is a Creator God. Yet Matthew Fox has followed his own mystical spiritual “journey” far enough that he now feels he has reached what mystic Meister Eckhart called “the ‘great underground river’ of divinity” (CCC, 230) within each of us. As I have previously pointed out in The Emergent “ONE” this idea of a “river of divinity” was also known in ancient Gnosticism as “the divine spark,” and you will come to see that Quaker founder George Fox ended up listening to seducing spirits and called this same patently false idea the “Inner Light.” In CCC all Matthew Fox is really doing when he refers to all of humanity as “other Christs” (137) is taking this thing taught by demons to its logical conclusion. Instead of welcoming Quakers like Guru Foster in to teach his mystic contemplative spirituality, this rotten root of Gnosticism ought to give evangelical leaders a very real source of serious concern for the actual origin from which Foster’s “Christian” mysticism comes emerging. But we cannot confine the existence of the divine to this one man [Jesus] among men. Therefore we are not to worship the man Jesus, though we cannot refrain from worshipping the source of this Holy Spirit or Christ-life, which for many of us has been revealed primarily in this historical figure (121, emphasis mine). He is clearly one of the leading contemporary writers and speakers on Christian spirituality. While maintaining his ties with Friends, Foster deliberately speaks to a much broader audience. Richard Foster grew up among Evangelical Friends. In adult life, he has been a Friends pastor and a professor of theology at Friends University among the many positions he has held. In his books and speaking, he frequently makes reference to Quaker historical figures and his own Quakerism. Well then, this would appear to be a good point at which to more thoroughly examine the history of Quakerism and its key doctrine of the “Inner Light.” In Part Two I will introduce you to George Fox, the man who would found the Quaker sect–initially known as “the Children of Light”–who claimed to have direct revelation from God. And we’ll look further into his unique teaching concerning this alleged “Inner Light” which he believed was inherent in all of mankind. You will come to see this warped and toxic view of human nature truly does flow from the exact same river of mystical muck as the other misguided mystics cited throughout this article. After all says mystic Evelyn Underhill, whom I mentioned earlier, in her Practical Mysticism it is “the immanence of the Divine Spirit within the human soul” that “lies at the root of a mystical concept of life” (viii, emphasis mine). In fact Underhill even refers to the “mystical genius of George Fox” in The Mystics of the Church (223) because the “Inner Light” taught by Fox is simply the same doctrine “of the Divine Spirit within the human soul” in different words. So it really shouldn’t come as a surprise that all mystics who continue to practice contemplative spirituality (transcendental meditation for the Christian) like that taught by the Quakers, which is espoused in evangelical churches by arguably “the best known Quaker in the world today” Guru Richard Foster, will eventually end up in these very same polluted waters of Gnostic mysticism.